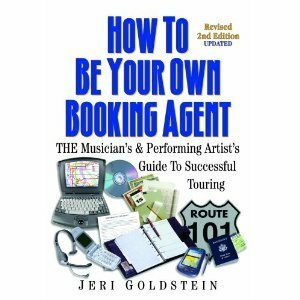 How to Be Your Own Booking Agent by Jeri Goldstein (paperback). Since 1998, the award-winning, How To Be Your Own Booking Agent has been among the top selling music and performing arts business books. It is regularly selected each semester by professors teaching music business and the performing arts and continually recommended by musicians and performing artists worldwide. Jeri Goldstein s unique step-by-step guide and resource book is artfully organized into 492 pages of savvy advice, realistic methods and action plans for the performing artist and is now available in its UPDATED Revised 2nd Edition. This completely updated edition provides current information about immigration regulations for touring artists, new technology advances in digital and electronic press kits and web design basics along with exciting new insights from experienced professionals in the entertainment business. There are 24 chapters enhanced with completely updated resource sections following each chapter packed with recommended books, directories, web sites, businesses and new conferences helping artists achieve their career goals and this revised edition is truly THE Musician s & Performing Artist s Guide To Successful Touring. How To Be Your Own Booking Agent THE Musician s & Performing Artist s Guide To Successful Touring tackles such topics as: The Art of Negotiating; How to Make Cold Calls; Setting Long Term Goals; Effective Telephone Techniques; Creating An Effective Promotional Package; Contracts; The Art of Touring; Managing the Road; Conferences; Trade Shows and Industry Events; Funding Sources; Crossing Borders--U.S./Canada Touring; Marketing Your Act; Accessing the Media: Print, Radio, Television and The Internet; Working with Your Record Company; Working with Managers and Agents; When to Quit Your Day Job; Hiring Help and Ethics and Attitudes. "As someone who has had the experience of climbing from the bottom to the top of the music industry, I find Goldstein's book to be THE road map for taking a career from oblivion to stardom, on one's own terms, while maintaining artistic integrity! By combining universal business practices with music industry savvy, HOW TO BE YOUR OWN BOOKING AGENT is your guide to success." RAVI, singer/songwriter, former guitarist for triple GRAMMY nominee, HANSON The information is visually accessible with worksheets and a variety of forms included throughout the book that may be copied for the artist's use and convenience. Jeri has answered most of the burning questions, provided immediately usable methods and tackled many of the foreseeable problems. Most importantly, though, she offers the performing artist a step-by-step guide to create a successful touring career. This book is signed by the author originally addressed to Tara 08/16/05 during the author's book tour. Book is in great condition almost like new.